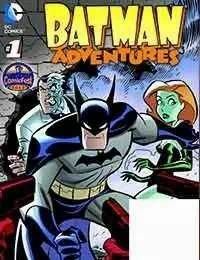 - Just in time for Halloween, its a FREE all-ages flip-book comic reprinting classic BATMAN and SCOOBY-DOO tales!- In his side of the comic, The Dark Knight meets Gotham Citys new vigilante, the Cavalier, and battles the evil of Ras Al Ghul in stories from BATMAN ADVENTURES #1 and #4.- And in the other side, the Mystery Inc. Gang tries to get to the bottom of The Costume Caper, in a story from SCOOBY-DOO, WHERE ARE YOU? #2.